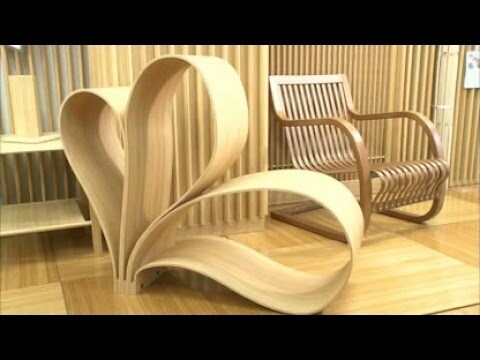 Tables made from bamboo folded like origami paper, and chairs with unusual and complex designs... These are some of the items of furniture made by this week's innovator. Bamboo is strong and doesn't break easily. That's why it has been used since olden times for baskets, sieves and screens. But it does also tend to warp, and that's why it hasn't been used for larger furniture. It bends out of shape when it loses its moisture. After much experimentation, our innovator has found a way to prevent that distortion. What is his surprising technique He says that he thought it up because it pained him so much to see the neglected state of the bamboo groves in his hometown. We see how perseverance pays off, as we trace the path and motivations of a truly dedicated bamboo craftsman and innovator. Note: Due to the strict copyright regulations of NHK, this video has a high chance of getting removed. 241 Wood-turning the root of all evil bowls !! !